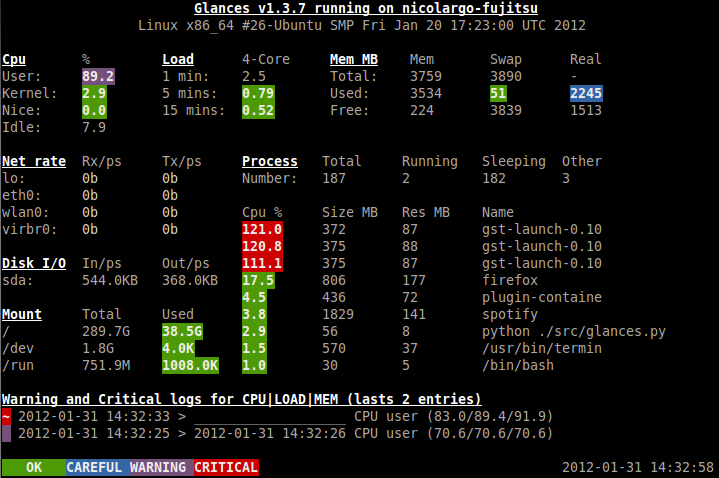 Glances is a system monitoring tool for GNU/Linux distributions. It grabs information from your system and display its in a CLI curses screen.Glances can monitor CPU, average load, memory, network interface, disk IO, file system space and processes. When a alert is detected, stat is automatically colored and the processes list sorted by CPU or memory.The latest version (1.3.7) displays a log history in the bottom of the screen with the latests alerts. Get More info from Documentation and Official site. Download Glances v1.3.7 from Here.